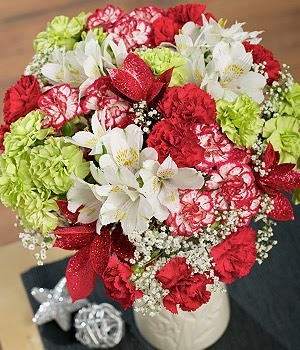 Bright and cheerful, this long-lasting Christmas bouquet features green and red Spray Carnations complemented by white and red edged Spray Carnations. Perfectly finished with white Alstroemeria, delicate Gypsophila and red glitter Ruscus to make a thoughtful festive gift. that the winner gets their prize before Christmas. I'm not the biggest Poinsettia fan but In love festive greenery like mistletoe and holly with red berries. I like festive greenery like holly with red berries and mistletoe. Hyacinyths - they smell so lovely. Poinsettia - it's so festive looking! Poinsettia, some friends brought me one round on Saturday when they came for a meal. Really really lovely bright colour that lasts for ages! I don't have a favourite festive flower but I love Gerberas! Mine would be Poinsettia like a few people have said - but I also really love Holly in festive bouquets, and pine cones too! Hyacinyths make the house smell gorgeous. I like white roses dipped in silver glitter. Poinsettia - it's the only one I can think of!